Salamander's 'Design:Tech Connection' event co-hosted with top specifier showcases technology solutions for multiple commercial meeting spaces. Boston-based commercial space designer Red Thread showed off some unique retro-chic looks for commercial huddle room spaces at the Salamander Designs' "Design:Tech Connection" event. Salamander Designs is out to prove to commercial end users and specifiers that zoom rooms, huddle rooms and conference rooms can be just as cool as residential spaces. As more residential integrators bring the style and panache of their resi solutions to the commercial world, corporate board rooms are being transformed from sterile workplaces into stylish high-tech locations. According to the latest CE Pro data, the average integration company now earns 32.5 percent of its revenue from commercial projects. Already the leading supplier of A/V furniture to the residential custom installation market according to the CE Pro 100 Brand Analysis, Salamander Designs is also experiencing tremendous growth in its commercial segment. According to Mike Babowicz, director of engineering, the company’s revenues in 2018 were about evenly split 50/50 between commercial and residential. “The aim is to bring design and technology together in complete room solutions." 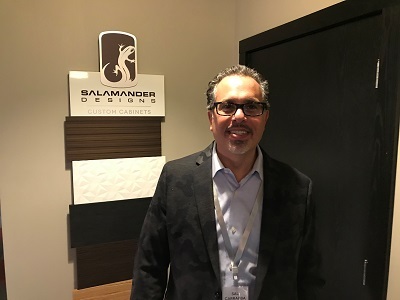 He predicts for 2019, Salamander will likely attribute 60 percent of its revenues to commercial furniture. Not bad considering the company did not even start focusing on commercial solutions until about 5 years ago. And there is a lot to be excited about on the commercial front. New technology in microphones, projectors and interactive displays, for example, require complementary furniture to house the equipment. But the days of the bland antiseptic office are over. Corporate end users want huddle rooms, zoom rooms and conference rooms that are not only utilitarian but comfortable and inviting. 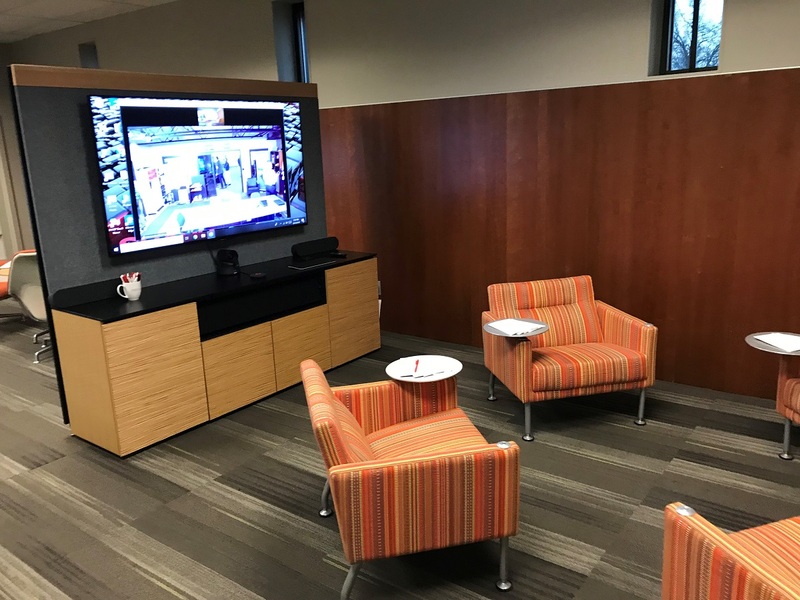 In an effort to showcase the latest solutions for meeting spaces, Salamander hosted its first-ever Design:Tech Connection event at its headquarters in Bloomfield, Conn.
“The aim is to bring design and technology together in complete room solutions,” says Salvatore Carrabba, president and founder. About 100 designers, specifiers and corporate end users attended the event, which was held in partnership with ACT Associates, LLC, an independent technology specifier based in Storrs, Conn., that touts an impressive slate of commercial clients, including Aetna, Autodesk, University of Connecticut and many others. Crestron, Avocor, Logitech, NEC, Sharp, Shure, Vivitek and Yamaha were all on hand showcasing their solutions. One large conference room features an 80-inch Sharp PNL705H4K interactive panel, Logitech cameras, Yamaha speakers and Shure 2x2-foot in-ceiling microphone. Everything was controlled by a Crestron interface. The Salamander conference table that acted as the centerpiece of the room housed a slew of equipment and provided easy access to the technology. The table itself was designed specifically for the AVI-SPL office in northern New Jersey. Downstairs, innovative workplace designer Red Thread, based in Boston, showcased two complete retro-chic huddle room setups that looked like they were pulled from the set of the hit show “Mad Men,” complete with orange lounge chairs. Later, Babowicz conducted tours of the 94,000-square-foot Salamander factory, which is designed to provide just-in-time inventory based on orders. The solar-powered factory can construct its average cabinet in just 40 minutes. Check out the slideshow to see more photos from the event!